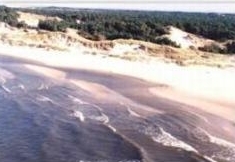 The Baltic, from the viewpoint of geological past is relatively a young sea. The Scandinavian continental ice-sheet had the decisive impact on the formation of this water-region. The sea started to come into being at the end of last glaciation, so called, the Vistula glaciation (Northern Polish). When thaw waters from the retreating continental ice-sheet started to gather in the area of present Gdańsk Bay, the sea throughout the time was increasing its area. Approximately 10 200 years ago, at the area of the present Baltic, there existed a sweetish lake being supplied also with the waters down-flowing from the regions situated in the south. After this period, a sudden warming followed, which caused the raise in water level and the connection with the waters of the current North Sea. The Yoldia Sea originated, being called after the mollusc living there. As a result of melting of the ice-sheet caused by the climate warming, there succeeded a slow uplift of Scandinavia. It led to the creation of another lake some 8 900 years ago, which after the shelfish living in its waters was calledThe Ancylus Sea. Further uplift of Scandinavia and simultaneously the descent of the coasts of the Ancylus Sea was the reason for formation of a new connection with the North Sea. The Litorine Sea was formed (from the name of a snail) of a larger scope and with more salty waters then the present Baltic. The Baltic at its current size originated around 2 000 years ago. In this period, its area was diminishing as a result of permanent land uplift, what had the influence for even more limited contact with the North Sea in the shallow Danish straits. Also, due to this reason, pouring of highly salted waters is hindered. Therefore, the waters of the Baltic Sea are proportionally low-salted. However, the Baltic per se, is called "the sweetest sea of the world". Currently, we have the period of mya, from the name of a mollusc (Mya arenaria - soft-shelled clam), which exists very numerously in the waters of today's Baltic. The area of the Baltic Sea within the borders of the SNP accounts for 11171,14 hec-tares (2 sea miles), what constitutes approx. 34% of the total area. This area has the salinity between 5 and 8 PSU (practical salinity unit). Hence, the environment is too sweetish for the genuine sea flora and fauna as well as it is too salty for freshwater organisms. The scope 5-8 PSU is defined as the zone of "species minimum ". The most numerous group of plants and animals constitute the sea species of a wide tolerance for salinity alterations (e.g. : cod, herring, shrimp), less numerous are the species typically of salt-water character (e.g. : aquatic crustacean, some gammaruse). In the coastal waters and sweetish bays there exist freshwater species (e.g. : perch, roach, fresh-water snail). In spite of the fact that in the Baltic there is not an impressive number of species, however, it constitutes a very interesting ecosystem. Phytoplankton - microscopic flora organisms (algaes) passively floating in the over-cleared surface of water-depth. Over 700 species have been proved to be present in the phytoplankton of the Baltic - there dominate diatoms, cyanide plants and stria plants. Phytobenthos - plants covering the sea bottom. In the Baltic, sedentary plants include the class of Chlorophyceae (e.g. : Cladophora, ribbon), Thallophyta (e.g. fucus), red seaweeds (e.g. banded weed and the red alga Furcellaria fastigiata) and flower plants (e.g. sea grass). Zooplankton - animal organisms floating passively lesser or more in the water-depth. This group includes both unicellular animals and multicellular organisms of a complex structure: rotifers, crustaceans (e.g. copepods) as well as a jelly-fish up-growing to several tens of centimetres in the diameter - aurelia and lion's mane jelly. Moreover, in the zooplankton of the Baltic there exist numerously, the larvas of fish, polychaeta and mollusc. Zoobenthos - animals living on the sea bottom. Among the Baltic bottom fauna there dominate the representatives of molluscs (e.g. : mussel, cockle, soft clam, Baltic mollusc), crustaceans (e.g. : barnacle, shrimp - Crago vulgaris, gammarus, aquatic crustacean - Mesidotea entomon, shrimp - Palaemon), snails (e.g. water snail), Polychaeta (e.g. nereid) as well as Oligochaeta. The most diversified bottom collections can be found on the stone bottoms. Nekton - large animals actively floating in the water-depth. There are classified fish and sea mammals. In the Baltic, there can be found 26 sea fish species, a few fresh-water fish species as well as bi-environmental species. Moreover, there exist four species of sea mammals. 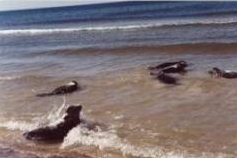 They are: grey seal, ring seal, common seal as well as the representatives of cetaceans - common porpoise.